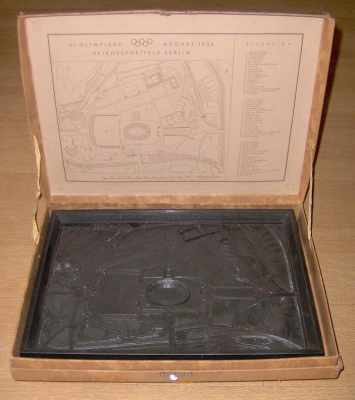 The five Olympic rings having already been utilized as a publicity badge for the Games as early as 1935 with a total sale of 400,000, the Organizing Committee decided to produce a special visitor's badge to be sold after the opening of the Festival. 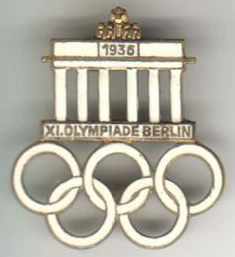 Professor Raemisch was also entrusted with the designing of this emblem, and utilized the landmark of Berlin and the Olympic rings, this time, however, the rings being placed under the Brandenburg Gate. An extremely attractive badge was the result, 675,000 being produced in Tombac and ivory enamel. The same design was enlarged to form an automobile plaque, the sale of these being restricted to limited circles. 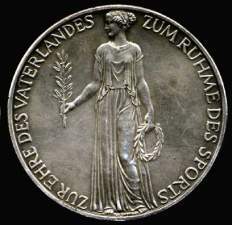 As a gesture of honour to the former Olympic victors, the Organizing Committee arranged a reception during the course of the Games for which occasion a special badge was created, this revealing the symbolic wreath held in a raised hand. An open space was also left for the engraving of the name of the victor and the Olympic Festival in which he attained his victory. 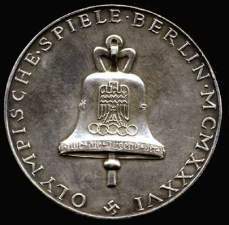 Messrs. Poellath in Schrobenhausen were entrusted with the production of these badges. During the journey to Athens for the meeting of the International Olympic Committee in 1934, the important question concerning the festive aspect of the Games was discussed. It was decided that the International Olympic Committee, as the supreme senate of physical culture, should constitute a unit at the Olympic Games and should be distinguished as such. The Secretary-General, Dr. Diem, therefore proposed that the form generally used for magistrates and scholastic dignitaries be adhered to, and since it was deemed impractical to institute robes of office, a large gold chain should be worn to symbolize the membership in the International Olympic Committee. This proposal was approved by the Olympic Committee. Six medallions were set into the links of a gold-plated, hand-worked chain, these being reproductions of antique originals from the period between 300 and 500 B.C. depicting a torch-runner, javelin-thrower, discus-thrower, two wrestlers, a weapon-runner and a youth with jumping weights. The five enamelled Olympic rings were attached to a large medallion revealing a reproduction of the head of Zeus from a Greek engraved gem in the Berlin State Museum. The reverse side of the medallion contained the inscription, "XI. Olympiade Berlin 1936," and space for additional Olympic Festivals. This chain was also created by the Berlin sculptor, Herr Lemcke, whose designs met with the approval of the President of the Organizing Committee. According to the regulations drawn up, these chains become the permanent property of the International Olympic Committee, and shall be preserved at the headquarters of the Secretary-General in Lausanne, being presented to the members of the Committee on the occasion of each Olympic Festival. Official Presentation Book Set of 6 Plaques. Illustrating Events of the Six Days of Ancient Olympic Games, from Greek Vases. Cast bronze, each 92 x 113 mm, with frame 130 x 152 mm. Dark gray bakelite, 29.7 x 21.8 cm, desiggned by Oskar Reich, made by Siemens-Schuckertwerke, both Berlin. Threedimensional view of Olympic 1936 games site, legend at top. In Original case, explanatory map on inside top. Bavarian State Mint. Olympic bell. Rev. Female presenting laurel branch. Presented by Reichsport Leader von Tschammer to participants. Mother of pearl, 49 x 34 mm. 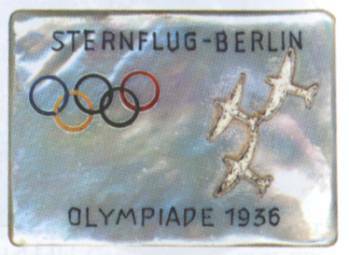 Three affixed silver airplanes flying towards color rings between Olympic legend.